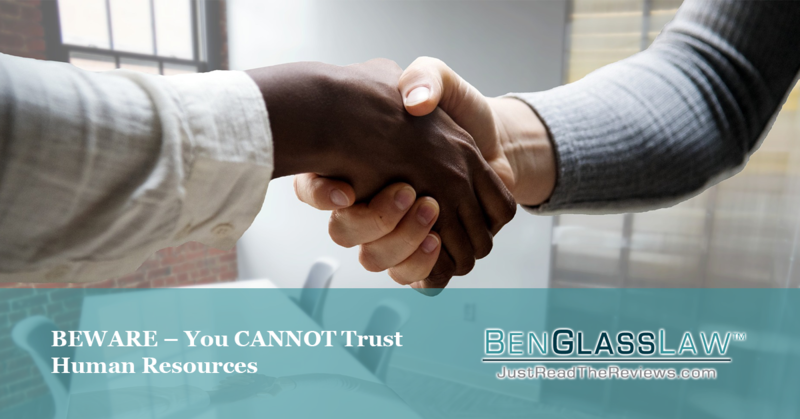 BEWARE – You CANNOT Trust Human Resources! Nothing against HR managers. Many are probably well-meaning and just want to help. But if your claim for disability benefits or life insurance benefits has been denied, that nice person in HR may turn out to be your worst enemy. Read on about how a Federal judge ruled that thanks to a twisted law called ERISA, no matter what they say, HR employees do not have to follow through on their promises. Even if by trusting them and following their advice you lose your chance to appeal, tough luck. HR is not even liable for damages. Wayne Dawson-Murdock had a great employer, who was literally in the business of caring for people – National Counseling Group, Inc. (NCG). Wayne passed away in 2016 and his wife, Rema, filed a claim for life insurance benefits through the workplace policy issued by UNUM. Both Rema and NCG were stunned to have the claim denied. It seemed that in March 2016, just months before Wayne passed, he had switched to part-time employment. Under the UNUM plan, only full time employees are eligible for Life Insurance benefits. Normally, when this happens, the employee is notified and in Wayne’s case, he was eligible to maintain his life insurance coverage by buying into a portable group policy. The problem? No one told Wayne or Rema this – not the HR team from NCG and not UNUM. Sure, it was in the policy, but since they weren’t even aware this could be an issue, they didn’t think to check the policy. Upon Wayne’s death, not knowing there was an issue with his coverage, Rema filed a claim for life insurance. She was shocked to get a call from an NCG HR representative, Christopher Baham (Vice President of Human Resources for NCG), telling her that Unum had denied her claim before she heard anything directly from UNUM. But, he told her, not to worry! Baham stated that NCG would pay her claim directly, and he would continue to work with UNUM on the denial so she would not have to deal with UNUM anymore. Sure enough, a few days later she received the denial letter stating that since Wayne had not converted to portable group coverage, no life insurance benefits were payable. But Rema didn’t worry. Baham told her NCG would pay, because of course they did not intend for Wayne to lose his life insurance protection when he started working part-time. Rema, thinking Baham was working with UNUM for her, did not contact or appeal to UNUM. Instead, she solely corresponded with Baham, who kept promising her that NCG was almost ready to pay her. In October he emailed Rema saying, “...we do not want to delay your receiving these benefits any further, so we are going to pay you the claim amount directly, and then we will be working on the issue with the insurance company. You will not have to deal with UNUM insurance company going forward.” It’s easy to see why Rema believed him! For the next four months, Baham and Rema kept conversing about her receiving the $150,000 payment she was promised from NCG “any day now.” Finally, in a phone call in February 2017, Baham informed Rema that actually, NCG would not pay her at all! To add insult to injury, NCG and Baham kept Rema hanging for so long that appealing directly to UNUM was impossible, as there is a strict deadline for ERISA appeals. Common sense tells us that NCG should have to make this right – right? After all, they neglected to tell Wayne in the first place that changing his status to part-time would affect his eligibility for NCG’s group life insurance coverage. Why would they do this? Were they evil? Trying to save a little money by dropping a covered employee? Our guess is neither – our guess is that they didn’t tell Wayne about his benefits because they had no idea themselves. We can’t tell you the number of times we’ve run into HR employees who mean well but have no idea what their disability or life insurance policies actually say. SPOILER ALERT – they probably don’t say what you’d want them to say! And the insurance company doesn’t care what insurance coverage you MEANT to provide – they only care about the letter of the policy, and if that allows them to deny claims that HR thinks should be paid, oh well. But what about Baham’s promise that NCG would pay? Shouldn’t NCG have to honor that? After pages of legal arguments about what constitutes a “plan fiduciary,” the judge ruled that no, NCG was not legally bound to keep its word. Because of the law governing the policy, the Employee Retirement Income Security Act (ERISA) of 1974, in order for Rema to get the money she was promised, she first had to prove that NCG acted as a plan fiduciary – an entity that is required to put the best interests of the insured first. Rema filed the suit for ERISA breach of fiduciary duty to herself and her husband, as well as for negligence and detrimental reliance and breach of contract. But ERISA has a narrow scope of who and what will count as a fiduciary. Simply because NCG bought and paid for that life insurance policy did not make them responsible for administering it correctly. NCG’s failure to tell Wayne that his eligibility for group life insurance plan changed once he started part time work, Baham’s repeated assurances that NCG would pay the claim themselves, and that he would take care of UNUM, did not fall under the umbrella of fiduciary activity according to the Court. In the end, this case is a powerful lesson to watch out for who you can trust. Rema put her faith in the Wayne’s employer and the “helpful” HR representative who made excellent promises. But the employer didn’t have to follow through and the courts didn’t make them because the case is governed by ERISA – a law that favors insurance companies, not the people who rely on them for benefits. So what can you do? There are some important lessons here. First, read your life insurance and disability policies like they were riveting bestsellers! Take notes, ask questions – not just of your HR rep, but of a lawyer who sees these policies all the time. Know what your policy covers and what it doesn’t, so when your circumstances change you’ll at least know to go back and read your policy. Second, if you file a claim and it has been denied, immediately seek out a reputable ERISA lawyer to appeal. Often you have as little as 60 days to file an appeal, and you generally only get one shot, so make sure it’s the best one possible. At BenGlassLaw we will review your denial letter for free and give you a written report on why we think the insurance company denied your claim and what we think you’ll need to do for successful appeal. We offer a flat-fee consultation for larger questions about how your policy, medical situation, current records, etc. all interact. Forewarned is forearmed. No matter how nice they are, no matter how sincerely they mean to and want to help, Human Resources does not have to pay you or follow through on any promises they make. If they make a mistake, YOU will pay.